distribution DISTRIBUTION: Throughout the Piedmont and extreme western Coastal Plain. There is a real hiatus in the central Coastal Plain, and it appears again near tidewater areas. Only known from three mountain counties; perhaps absent rom the northern mountains. abundance ABUNDANCE: Uncommon to locally fairly common in the Piedmont; rare to absent in most of the Coastal Plain, but locally uncommon in tidewater areas near red cedars. Absent to locally very rare in the mountains, though there were several records in 2011 from Buncombe County, and numerous records from Madison County in 2012.
flight FLIGHT PERIOD: Two broods, quite extended in time for a Callophrys species. In the Piedmont, late March to mid-June, and late June to early September. The Coastal Plain flight has a gap between broods in late May or early June. In both provinces, the gap between broods is narrow. The meager mountain data suggest a small brood in April (and certainly into May) and from mid-June to early August. habitat HABITAT: Always near red cedars. Eastern red cedar (Juniperus virginiana) is the key species in the Piedmont, whereas southern red cedar (J. salicicola) is the foodplant in the tidewater area. The species is usually seen along woodland borders, powerline clearings, or old fields, in dry situations; cedars are always present nearby. The species also occurs in foothills around outcrops where cedars are present, such as in the Brushy Mountains. In the tidewater region, it is present near brackish marshes and thickets, especially on coastal islands, where the cedar is found. plants FOOD AND NECTAR PLANTS: Red cedars are the only foodplants. 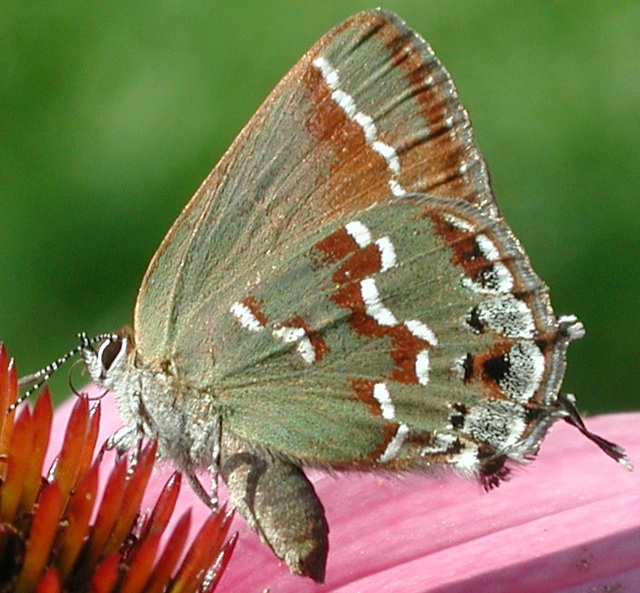 The butterflies nectar on many flowers of woodland borders, such as New Jersey tea and various composites. 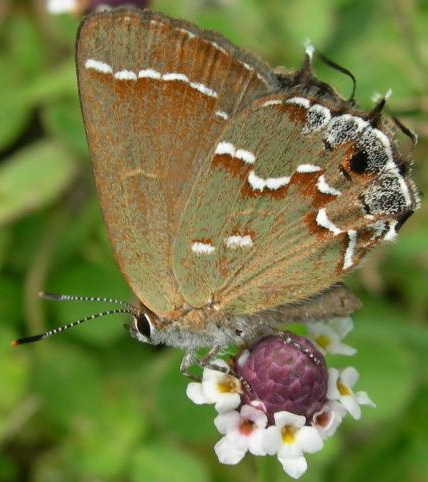 comments COMMENTS: Though by no means a common butterfly, this is one of the easier hairstreaks in the state to find. It is often encountered by chance along a woodland border; however, it may be purposefully searched for in places where cedars are abundant, such as in circumneutral soils or around rock outcrops. The absence over most of the Coastal Plain is real, as both species of red cedars are rare to absent except near tidal water. 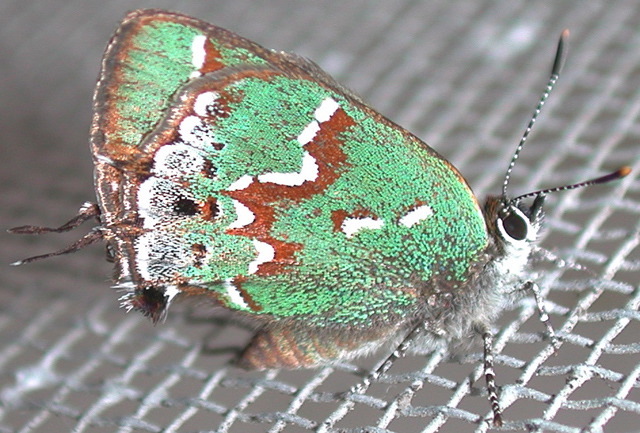 However, cedars are not overly uncommon in some mountain areas, and Juniper Hairstreaks should be expected in other counties there.